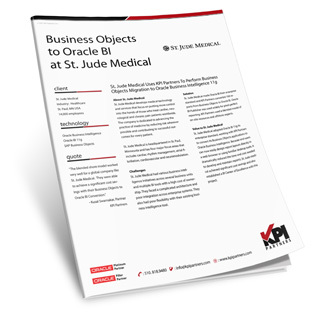 St. Jude Medical had various business intelligence initiatives across several business units and multiple BI tools with a high cost of ownership. They faced a complicated architecture and poor integration across enterprise systems. They also had poor flexibility with their existing business intelligence tool. 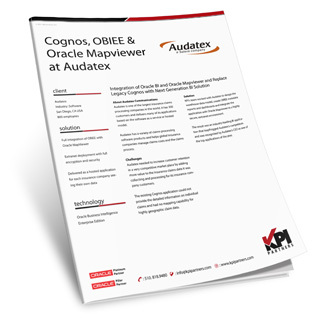 Audatex needed to increase customer retention in a very competitive market place by adding more value to the insurance claims data it was collecting and processing for its insurance company customers. 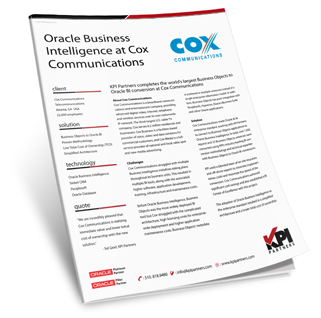 Cox Communications struggled with multiple Business Intelligence initiatives taking place throughout its business units. This resulted in multiple BI tools, along with the associated higher software, application development, training, infrastructure and maintenance costs. 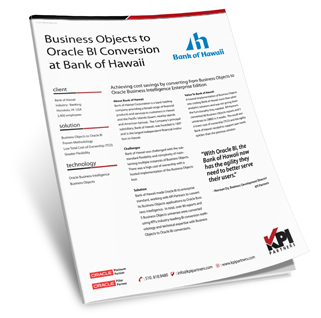 Bank of Hawaii was challenged with the substandard flexibility and complexity of maintaining multiple instances of Business Objects. 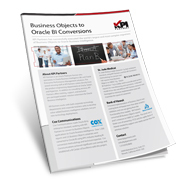 There was a high cost of ownership with a hosted implementation of the Business Objects tool. Many organizations are converting their existing Business Objects universes and reports to Oracle BI. 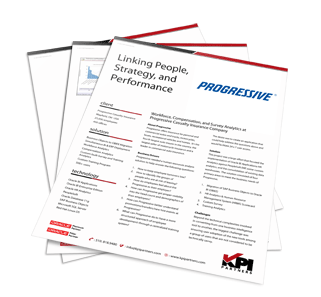 KPI has a proven methodology for Business Objects to Oracle BI migration based on experience with the largest and most complex migration projects in the world. Mercer HR is a global leader for trusted HR and related financial advice, products, and services with 18,000 employees that are based in more than 40 countries.